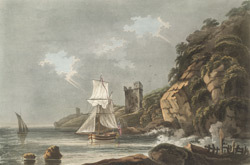 View of the coast at Fowey in Cornwall. This castle, town and haven, take their name from the River Fowey (pronounced Foy). It was once a very considerable sea port with many ships of war and naval stores. However it was vulnerable to attack by the French, who in 1457 burned the town. The engraver is Francis James Sarjent (c.1780-1812) (successor to Mr F. Jukes) who exhibited at the Royal Academy in 1802.